With the Proform SpaceSaver DX elliptical at last you can afford a decent trainer and still have money in your pocket. It comes with all the basic features you need, plus an incline ramp for advanced muscle targeting, and a music port to plug in your iPod or mp3 player. And with its fold away design, you don’t have to sacrifice space in your bedroom or home gym. UPDATE: The SpaceSaver DX has been replaced with the SmartStrider series ellipticals for the new year. You can check them out as well as the other new models reviewed here. 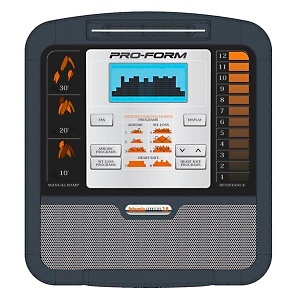 While experts give kudos to features such as the power ramp -- something not often seen on a budget elliptical machine -- they often mention that ProForm uses many cheaper components when building their machines. This is why the warranty on the ProForm SpaceSaver DX is so limited; otherwise, they couldn’t afford to replace parts for so many customers. It’s recommended you look into extending the warranty for 2 to 3 years when purchasing one of these machines. Costumers are satisfied with their purchase of the Proform SpaceSaver DX and feel they are getting their money’s worth for $799. Even though it’s only three settings, having the adjustable incline is always considered a selling point on an elliptical; so if you can afford a machine that offers it -- buy it. All being said, this is a budget model so be advised it’s not designed to hold up to excessive abuse; but you should feel safe that it will give you a good sweat 3-5 times a week for a couple of years. 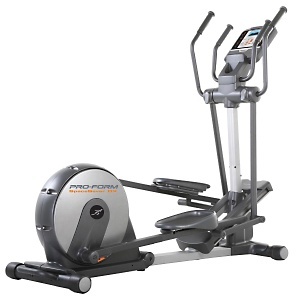 The Proform SpaceSaver DX elliptical compares in price ($799) and value to the NordicTrack AudioStrider 800 (both are built by ICON Fitness). The components are virtually identical, the resistance levels, 8 programs, and 3-stage manual power incline -- all exactly the same. The display consoles have a different appearance, and the 800 offers the iFit® Workout Technology, but that’s about it. With free shipping offered on both brands, the choice between the two will come down to which one is on sale, and how badly you want the iFit feature.